Immigration's magnitude - its deep demographic, economic, and social implications - calls for reasoned and disinterested debate grounded on quality data, coherent principles, and ethical values. Yet throughout the postindustrial world few topics are as unsettling as the economic consequences of immigration, the ubiquitous presence of undocumented immigrants, and the adaptation problems of the children of immigrants. The story of immigration during the first decades of the twenty-first century is one of paradoxes. More people are now on the move than ever before, a lot more, and the number is on the rise, with 214 million people classified as international migrants by the United Nations in 2010 compared with 178 million just a decade earlier and 156 million in 1990 (see figure 1). While the potential for immigration continues to gather momentum, the reality of international immigration remains quite stable when viewed as a global phenomenon in a world with a growing population. Although migration is at once a local and global phenomenon in its causes and impacts, it is not occurring everywhere at the same pace. Consider Europe, for example. The continent that shed over fifty million souls in the great mass migration of 1890 to 1910 has seen a rapid growth in new migration. With approximately seventy million immigrants, the rate of international migration into Europe today is greater than that of any other region of the world. In some countries, such as Spain, Italy, and Ireland, this is new and without precedent in the modern era. Overall the rate of immigration is now ten times greater in the higher-income countries than in the developing world. In the United States the foreign-born share of the population - approximately thirty-eight million (12 percent) - is lower than at the peak of the transatlantic migration in 1890 (14.8 percent), but it is much higher than it was just thirty years ago, when the current era of migration was getting under way (6.2 percent). International migration may be ubiquitous and deeply rooted in historical relationships between well-traveled sending and receiving corridors, but sometimes the context is dystopic.6 The United States is a case in point. It is contending with the largest number and proportion of unauthorized immigrants in recent history, even as it is facing a bevy of unrelated but relevant woes: the deepest economic crisis since the Great Depression, war, terrorism on a global scale, and a neighbor to the south convulsed by a drug war. A political ethos of divisiveness and the resulting gridlock add their own alchemy to the increasingly combustive problem of unauthorized immigration. This new master context bedevils serious efforts to manage migration. Furthermore, in the United States, current difficulties have been building because the country has never adequately adjusted its policies and bureaucracies to the new realities of global migration. We have an early-twentieth-century system in place to manage a twenty-first-century problem. As a result, all immigration lines seem broken: the line at the border (where more people are dying trying to enter the United States than ever), the queues in U.S. consulates, and in U.S. Citizenship and Immigration Services offices all over the homeland. All factions in the multisided debate over migration agree on one point: the system is broken. The size of the unauthorized population, an estimated eleven million or so, is only one symptom. There are over three million people waiting between four to twenty years to join relatives who are U.S. citizens and permanent migrants. If you are a U.S. citizen and your sister is in the Philippines, you will have to wait on average twenty years before she can join you. If you are a U.S. citizen and would like to sponsor your unmarried adult child in Mexico, you will wait sixteen years. And if you are a start-up in Massachusetts and set out to hire a skilled Indian worker with college education and proven experience in her field, you will pay thirteen thousand dollars in fees and wait twenty years. 1. Unauthorized migration has become persistent and widespread. The population of unauthorized migrants is larger both in number and as a share of the total than at any time since the United States began trying to regulate immigration in the early twentieth century. While they account for less than a third of the overall immigrant population, the unauthorized dominate public perceptions and nearly all policy debates and interventions. 3. The mass migration wave of the past generation has had a lasting demographic echo. The children of immigrants, estimated at over seventeen million, are a fast-growing sector of the child population in the United States. This is especially significant during an era of low and declining birthrates in the native-born population. In the United States more than three-fourths of the population growth over the past decade is accounted by immigrants and their children. These features of the new immigration constitute discrete scholarly domains and also have come to dominate the work of journalists working to inform our national debate. In this book we bring perspective to the contentious subject of immigration by gathering the experiences of a group of leading academics and journalists who make it their vocation to grasp and explain a phenomenon that is at once local and global, familiar and uncanny, concrete and abstract, timely and eternal. We examine how scholars and journalists enter, shape, and reshape the national conversation on immigration. While the ethos and eidos of writing immigration differ in the cultures of journalism and academia, the two domains live in a state of synergy, tension, and sometimes misunderstanding. 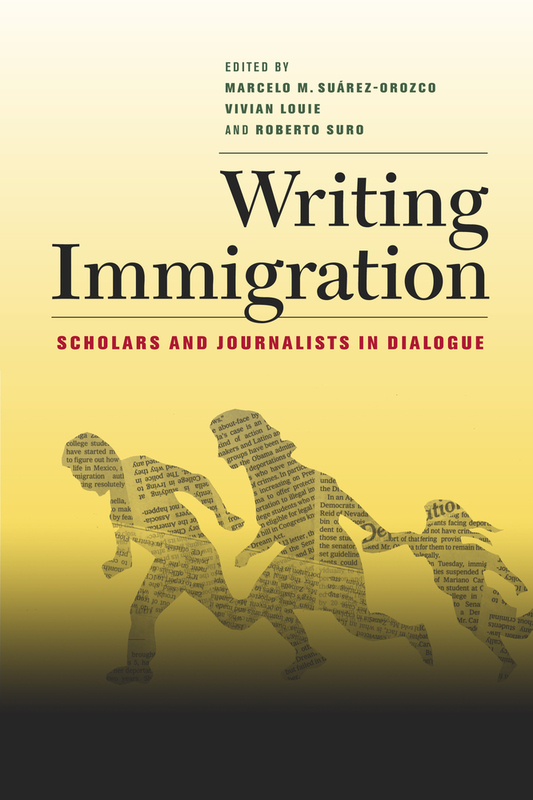 The chapters in this book detail how scholars and journalists manage the complexities of immigration - and of working with each other - as they inform and sometimes transform the national debate, each with distinct sets of incentives, sensibilities, and values. The habitus animating the world of journalism is profoundly different and in some ways incommensurable to that of academia, yet the two domains live in a state of mutual interdependence. Journalists are consumers of scholarship - materials that are typically gathered in a tempo and style that is antithetical to the I-need-it-now world of the twenty-four-hour news cycle. The culture of the footnote - exhausting, full of qualifiers, exceptions, and caveats - and the culture of the sound bite or of the 750-word newspaper article are like oil and vinegar. Scholars work with the long view in mind and are always mindful of the peer-review process and the vicissitudes of grant making. Journalists live under the tyranny of the next deadline, the gaze of the editor, and, as the business model for print news continues to face difficult odds, the bottom line. If it is obvious why journalists need academics, scholars are willing partners. The mass media is a vehicle to convey the lessons learned to broader audiences (and, albeit momentarily, see scholarly contributions move out of the splendid isolation in which perhaps most academic research dwells). The officers at the granting foundations - the lifeline of new research, value references to work they have supported in the major media because they hope to influence public opinion and policymaking. Deans and development officers scan the prestige outlets every morning for references to work by their faculty members to earn bragging rights for their institutions. In his introduction, Roberto Suro, a veteran newspaper journalist, senior researcher, and now a professor of journalism and public policy at the University of Southern California, frames the representation of immigration in the two domains. Both the news media and the social sciences, he claims, have contributed to misperceptions about contemporary immigration in ways that have raised the public's anxieties and hindered effective policymaking. For different reasons, journalists and academic researchers have tended to focus on individual narratives or group characteristics in rendering portrayals of immigration. The cumulative effect is to depict the immigrant as the protagonist who drives all of the action. Meanwhile, little attention is given to the many ways that the host society is structuring the trajectories of immigrant flows. The immigration story is thus robbed of context, and the results are evident in public policies that focus almost exclusively on trying to affect the migrants' behavior - for example, physically preventing them from crossing the border, apprehending and deporting those without authorization, and the like - rather than acting on causal factors in American society. Furthermore, Suro argues that changes in the U.S. news media are exacerbating long-standing characteristics of immigration coverage, including highly episodic attention to the subject and a disproportionate focus on illegality. Meanwhile, a variety of recent developments have challenged both journalists and social scientists to find new ways to frame their accounts of immigration. Chief among them is the need to understand the factors that produced an extraordinary, and perhaps anomalous, surge in the number of low-skilled migrants coming to the United States from 1995 to 2005. While much work has been done on the long-term structural underpinnings of migration flows, we have a much weaker grasp on the effects of business cycles and other short-term factors despite their importance to public perceptions and policy formation. The prolonged controversy over mass immigration is embodied in the lives of the eleven million U.S. immigrants without papers. Part One of the book explores immigration and the law. In chapter 1, "The Making of an Outlaw Generation," Nina Bernstein reflects on her five years of immigration coverage for the New York Times. She examines the impact of escalating immigration enforcement on a generation of children in unauthorized or mixed-status immigrant families. More than a million are coming of age without proper papers; at least four million others are at risk of deportation or family separation because a parent is in the country illegally. Bernstein asks, "Are these children and young adults forming a new kind of American caste system, one that challenges the nation's concepts of civil rights? At a time when a culture of fear permeates many immigrant communities, and demands for more stringent enforcement come from both political parties, how do journalists and academics researching questions of assimilation deal honestly with the issue of legal status without putting vulnerable subjects at risk?" Using examples from her work, Bernstein discusses this growing challenge and how it affects both news coverage and social science research. In chapter 2, "The Integrated Regime of Immigration Regulation," Cristina M. RodrÌguez of New York University School of Law turns to the matter of state and federal mechanisms for regulating migration. The case of Arizona's controversial law requiring that "the police check the documents of anyone they stop or detain whom they suspect of being in the country illegally" is a case in hand.9 It is also the tip of the iceberg. During the first three months of 2010, "legislators in 45 states introduced 1,180 bills and resolutions relating to immigration; 102 laws have passed compared with 222 in all of 2009, according to the national Conference of State Legislators. "10 RodrÌguez argues that while the involvement of states and localities in immigration regulation has long been considered legally aberrant, in practice, subfederal activity represents a crucial component of a comprehensive regulatory regime. She explores how the overemphasis on conceptual and regulatory uniformity obscures the potential of policy diversity and federal-state cooperation to address the social and political challenges immigration presents. RodrÌguez suggests that federal-state relations should not be understood as a zero-sum game in the immigration context. In developing this claim, she considers the obligations each level of government owes to the other, as well as how mechanisms of oversight and accountability can be implemented to ensure that the federal-state balance of power remains stable and functional. In chapter 3, "What Part of Illegal Don't You Understand?" Dianne Solis of the Dallas Morning News suggests that answering that question is not easy. Immigration law is increasingly intertwined with criminal law to the point of creating a new "crimmigration" regime. Due process questions come up frequently as the toughest crackdown in decades touches the lives of illegal immigrants, legal permanent residents, and U.S. citizens. Moreover, in her reporting, Solis found the law is full of contradiction. Unauthorized children have a right to a free public education under the Supreme Court decision of Plyer v. Doe (see Cristina M. RodrÌguez's chapter in this volume) but cannot take a job legally when they graduate from high school. "Mixed-status families," Solis writes, "live with both the fruits of citizenship and the risk of deportation." From her years of reporting in Texas, Solis argues for the importance of calibrating the legal lens while recognizing the essence of the writer's craft is finding the humanity in the story. That can mean changing the camera angle frequently through story selection that takes readers inside the lives of police officers, clinic directors, as well as children with a parent who has been deported. In chapter 4, "Some Observations about Immigration Journalism," Peter H. Schuck of Yale Law School argues that "immigration journalists are congenitally and perhaps professionally and ideologically drawn to individual stories, usually stories of incompetence or illegality by the immigration agency." By exposing the injustices "the little guy" suffers at the hand of a cold-hearted bureaucracy, journalists perform a tried-and-true public service. Echoing a theme developed by Roberto Suro in the introduction, Schuck suggests that journalists should also strive to inform readers about the more systemic, less individualized effects of immigration and the challenges and trade-offs encompassed in immigration policy and control in a modern democracy. In Interlude I, "Covering Immigration: From Stepchild Beat to News-room Mainstream," the veteran Los Angeles Times writer PatrickJ. McDonnell takes us to ground zero of the new immigration debate: Southern California in the 1990s. He reflects on the two distinct challenges he faced day in and day out: the first was "how to get attention for stories about immigrants and refugees, a population little known to most editors, and reporters." The second challenge was "how to write such articles without being perceived as an advocate." He reminds us of the principle of "fairness" to all sides in the debate, even if he acknowledges that absolute objectivity is an illusory goal. Most reporters, McDonnell suggests, are sympathetic with the plight of immigrants. "Standing up for the underdog," he notes, is a hallowed journalistic tradition. Behind the immigration story is a fundamental human drama of searching for a better life in a new country. It is a narrative that most journalists find irresistible. But what to do with the "backlash" that mass migration generates in times of crisis? McDonnell revisits his own struggles throughout his career "to help explain what was going on, and how California was pushed to this nasty precipice." He returns to the time-honored journalistic values of "fairness and listening to all sides" of the story as the safest path to documenting the multiplicity of voices in the immigration debate. In Part Two of the book we turn to immigration and the economy in a time of crisis. In chapter 5, "Consensus, Debate, and Wishful Thinking: The Economic Impact of Immigration," Edward Schumacher-Matos, formerly of the New York Times and the Wall Street Journal and currently the director of the Harvard Migration and Integration Studies Project and a columnist for the Washington Post, asks what is the economic impact of immigration - including illegal immigration - at a time of economic crisis? The answer, Matos suggests, is crucial for Americans and immigrants alike. He reviews in careful detail the nature of the debates in the field of economics. The consensus among economists is that on balance immigration's impact on the economy is positive. However, it is a complex story defying easy generations, never mind sound bites. Matos presents the state-of-the-art research and prudently paints a nuanced picture of what is known and not known in this ever-contentious debate. Immigration's negative effects, he notes, have been on the wages of unskilled workers, many of whom are poor African Americans and United States - born Latinos, and on local taxes in communities that have to deal with the services required with the sudden influx of young families with education and medical needs. But at the macroeconomic level, immigrant workers benefit the economy. "The expanded supply of cheaper labor stimulates the economy," he writes. "Some immigrants, particularly high-skilled ones, stimulate it even further by contributing to innovation. All workers thus benefit; complementary workers benefit the most." But perhaps what is most important eludes neat measures. Think of how the inventions of immigrants from diverse regions of the world - such as Hungarian mathematician John Von Neumman (computer), Argentinean physician RenÈ Favarolo (cardiac bypass surgery), and Russian computer scientist Sergey Brin (Google) - have completely transformed entire sectors of the U.S. economy and society, from defense to health to information technology. In chapter 6, Barry R. Chiswick, chair of the Department of Economics at George Washington University, reviews his "Top Ten Myths and Fallacies Regarding Immigration" to the United States. According to Chiswick, these "myths and fallacies have impeded the development of a national consensus regarding the reform of immigration law and policy so as to better serve the economic, humanitarian, and international interests of the United States." The chapter closes with Chiswick's response to the least favorite question he is frequently asked: "Are you for or against immigration?" In Interlude II, "A Son of Immigrants on Covering Immigration," George de Lama, the former managing editor for news at the Chicago Tribune and currently head of communications at the Inter-American Development Bank, offers an instructive personal reflection on three decades of journalism starting as a cub reporter in Chicago. Back then, writing immigration in the Windy City was an exotic "cross-cultural experience" akin to writing about the Bororo or the Arunta in faraway places. Immigrants were the Other next door. De Lama is not only a witness to the changing practice of journalism qua immigration; his career embodies the very transformations that define how journalism continues to struggle with writing immigration. Yet reading his personal narrative today, we are also reminded of the old French adage: "The more things change, the more they remain the same." The fundamental unit of migration is the family - variously conceived and structured in different regions throughout the world. While at the manifest level immigration is driven by labor, demographic, and economic variables (among other things, segmented labor markets and wage differentials), at the latent level immigration's enduring root is the family. Immigration is an ethical act of, and for, the family. Immigration typically starts with the family and family bonds sustain it. Immigration will profoundly change families as well as the societies in which immigrants settle. The children of immigrants are the fruit borne of immigration. They are a fast-growing sector of the youth population in nearly every immigration-dependant country today, including Australia, Canada, Germany, Italy, the Netherlands, Spain, and Sweden. In the United States, approximately one quarter of all youth are of immigrant origin, and it is projected that by 2050 over a third of all children will be growing up in immigrant households. The transition of immigrant-origin children to their new societies is a topic of scholarly concern and journalistic relevance. But the long-term consequences of mass migration, embodied in the lives of the children of immigrants, are a neglected problematique in the field of migration studies. In Part III of the book, we turn to some of the most urgent issues defining the second generation of immigrants. In chapter 7, "The Education Transformation: Why the Media Missed One of the Biggest Stories in America," Ginger Thompson of the New York Times deconstructs her rich experiences writing about the littlest, newest Americans. She argues that in the past decade immigration "has fueled the most robust growth in public schools since the baby boom, severely straining the capacity of districts already short on resources needed to serve students with special needs, and putting classrooms on the front lines of this nation's fights over how to assimilate immigrants and their children." Making matters more complex yet, the mass influx of English-language learners coincided with the federal No Child Left Behind law, arguably the most sweeping education reform in modern American history. "Then, as if their obligations to provide equal opportunities were not impossible enough," she writes, "schools across the country were thrust into the crosscurrents of a severe economic crisis and an anti-immigrant firestorm that not only slowed the pace of immigration, but also shifted the terms of the national debate from how to best educate immigrant children to whether those living here illegally should be educated at all." Based on her work with education reporters, researchers, and school officials across the country, Thomson shares the challenges trying to cover education in a time of deep demographic change, educational crisis, and political malaise. In chapter 8, "Moving Stories: Academic Trajectories of Newcomer Immigrant Students," Carola Su·rez-Orozco of New York University, Steinhardt School of Culture, Education, and Human Development, reviews some findings from one of the signature social science studies of immigrant children in American society. According to C. Su·rez-Orozco, immigration to the United States presents both challenges and opportunities that shape students' academic achievement. She identifies varying academic pathways of newcomer adolescent immigrant students over the course of a five-year-long longitudinal study. Her findings are multifaceted and defy sound bites about the nexus between immigration and education, "although some newcomer students performed at high or improving levels over time, others showed diminishing performance." It is a complex tale involving school characteristics (including school segregation, school poverty rate, and student perceptions of school violence), family characteristics (including maternal education, paternal employment, household structure, country of origin, and undocumented status) and individual characteristics (including academic English proficiency, academic engagement, psychological symptoms, gender, family separations, and number of school transitions). These constellations of factors were associated with different trajectories of academic performance over time. C. Su·rez-Orozco draws on a series of case studies to illustrate the ways in which multiple variables work together to shape the experiences and trajectories of newcomer immigrant students. Tyche Hendricks, formerly of the San Francisco Chronicle and now at the University of California - Berkeley's Department of Journalism and KQED Public Radio in San Francisco, writes about California's struggle with deep demographic changes at a time of economic crisis and cultural concerns. In chapter 9, "Who Will Report the Next Chapter of America's Immigration Story," she focuses on how California is integrating newcomers and in turn how they reshape the state. Hendricks draws on seven years of reporting, trying to provide readers with "an understanding of the history, causes, and context for immigration as well as its consequences." She argues that journalists are supposed to raise questions about the "social impacts of immigration and the nation's struggle to integrate immigrant families and, at the same time, to examine the way immigrants and their children assert themselves and transform their new environs. One way to do that is through telling the human stories that help readers understand other people in their communities as individuals." She draws on examples of her reporting for the San Francisco Chronicle at a time of industry-wide changes within journalism. In chapter 10, "Complicating the Story of Immigrant Integration," Vivian Louie of the Harvard Graduate School of Education deconstructs the matter of immigrant parental involvement in education. Based on a sociological study of second-generation Dominican and Colombian young adults and their parents, Louie reframes parental involvement by examining the world of parents as immigrants. The immigrant family experience, Louie reports, is shaped by the social isolation of parents and an emerging immigrant cultural identity of marginalization. This identity persists long after arrival and cuts across social mobility paths, although it is experienced in different ways according to social class. Louie describes a poignant "sense of being alone in America among the immigrant parents" that bears upon their children's sense of being on their own in American schools. Louie argues that policymakers need to consider how best to incorporate newly arrived immigrants and their children, particularly strategies for immigrants to develop strong affiliations in the multiple domains of their lives in the United States. Mary Waters of Harvard University concludes on a more optimistic note in chapter 11, "Debating Immigration: Are We Addressing the Right Issues?" This chapter reminds us of Sherlock Holmes's marvelous story of a crime solved because the dog in the barn did not bark. Sometimes what is most important is what is not heard. She comes back to Suro's dictum that immigration coverage tends to be crisis-driven. Waters overviews research on patterns of socioeconomic mobility and integration among the adult children of immigrants to the United States. The story is that "these young people are showing patterns of upward generational mobility, [and are] doing better than their parents and better than comparable native-born Americans of the same racial backgrounds." Waters contrasts the American experience with "more difficult and troubling patterns of integration of the second generation in Western Europe." She concludes with a reflection of why the media finds more space for stories of downward mobility and blocked incorporation "and the policy implications of not publicizing and recognizing the generally good news about immigrant incorporation that social science has documented." 1. United Nations Development Programme, Human Development Report 2009 - Overcoming Barriers: Human Mobility and Development (New York: United Nations Development Programme, 2009). 2. In the United States, California, Hawaii, New Mexico, and Texas are majority-minority states. 3. See Sanket Mohapatra, "Almost a Third of Indians, or over 300 Million People, Are Migrants," at People Move: A Blog about Migration, Remittances, and Development, online at http://blogs.worldbank.org/peoplemove/almost-a-third-of-indians-or-over-300-million-people-are-migrants. 4. See Aristede Zolberg, "Beyond the Crisis," in Global Migrants, Global Refugees: Problems and Solutions, edited by Aristede Zolberg and P. Benda (London: Berghahn Books, 2001), 1 - 16. 5. The U.S. Department of Homeland Security estimates that the unauthorized immigrant population living in the United States decreased to 10.8 million in January 2009 from 11.6 million a year earlier, and the estimated annual inflow of unauthorized immigrants to the United States was nearly two-thirds smaller in the March 2007 to March 2009 period than it had been from March 2000 to March 2005, according to new estimates by the Pew Hispanic Center. This reverses a pattern of nearly three decades of unauthorized immigration to the United States. The collapse of Lehmann Brothers and the deep recession it ignited did what 9/11 failed to do: it froze illegal immigration to the United States for the first time in thirty years. The "new normal" in immigration today, at least in the United States, seems to be inertia. Would-be returnees are staying put as are those who under the previous regime might have considered migrating without authorization. Any expectation that the economic debacle would result in massive self-deportations has not materialized. Likewise, there have been no changes in the patterns of legal - read: family reunification - migration to the United States. 6. "The gap between the goals of national immigration policy . . . and the actual results of policies in this area . . . is wide and growing in all major industrialized democracies, thus provoking greater hostility toward immigrants in general (regardless of legal status) and putting intense pressure on political parties and government officials to adopt more restrictive policies." From "Introduction: The Ambivalent Quest for Immigration Control," in Controlling Immigration: A Global Perspective, edited by Wayne Cornelius, Philip Martin, and James Hollifield (Stanford, Calif.: Stanford University Press, 1994), 3. 7. In the past decade, between five million and six million unauthorized migrants in the European Union have been regularized through various programs. Among the twenty-seven EU countries, twenty-two have adopted some measures of regularization in the past decade. See Maurizio Ambrozini, Undocumented Migrants and Invisible Welfare: Beyond the Rhetoric (Milan: Department of Sociology, Universit‡ degli studi di Milano, 2010). 8. This is happening in the context of a fundamental shift: below-replacement fertility rates at a time rapidly aging native populations are entering the demographic winter of their lives in huge numbers. This is the case Germany, Greece, Italy, Japan, Russia, Spain, and elsewhere. In the United States some eighty million baby boomers, the vast majority of them of white-European nonimmigrant origin, will retire shortly, generating a void in various sectors of the economy and society. 9. Jennifer Steinhauer, "Arizona Law Reveals Split within G.O.P.," New York Times, May 22, 2010, 1 - 11 (quotation on page 1). 11. The chapters in this book are original and were developed for a conference in 2008, the first of its kind, of the Nieman Foundation for Journalism at Harvard University on "Covering Immigration: Journalist and Academic Perspectives." Bringing nuance, complexity, and clarity to a subject often seen in black and white, Writing Immigration presents a unique interplay of leading scholars and journalists working on the contentious topic of immigration. In a series of powerful essays, the contributors reflect on how they struggle to write about one of the defining issues of our time—one that is at once local and global, familiar and uncanny, concrete and abstract. Highlighting and framing central questions surrounding immigration, their essays explore topics including illegal immigration, state and federal mechanisms for immigration regulation, enduring myths and fallacies regarding immigration, immigration and the economy, immigration and education, the adaptations of the second generation, and more. Together, these writings give a clear sense of the ways in which scholars and journalists enter, shape, and sometimes transform this essential yet unfinished national conversation. Marcelo M. Suárez-Orozco, The Ross University Professor at New York University, is the author and editor of many books including Latinos: Remaking America (UC Press), co-edited by Mariela Páez. Vivian Louie is Associate Professor of Education at Harvard University and the author of Compelled to Excel: Immigration, Education, and Opportunity Among Chinese Americans. Roberto Suro is Professor of Journalism and Public Policy at the University of Southern California and the author of Strangers Among Us: Latino Lives in a Changing America, among other books. "Bringing together academics and journalists--inviting them to talk with, not at, one another--is an enterprise as important as it is rare. When the participants in the conversation are as lively, provocative and insightful as the contributors to Writing Immigration, the result is a real treat. For anyone who wants to understand how immigration is molding the nation's future, this book is an indispensable read.” --David Kirp is a professor at the Goldman School of Public Policy at the University of California at Berkeley and former associate editor of the Sacramento Bee. 3. What Part of “Illegal” Don’t You Understand? 9. Who Will Report the Next Chapter of America’s Immigration Story? 11. Debating Immigration: Are We Addressing the Right Issues?